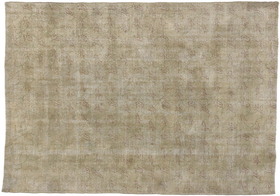 Distressed Turkish Rug Modern Industrial Style 6’11 x 9’10 From Esmaili Rugs Collection. Vintage hand-knotted Turkish rug with distressed composition featuring meandering floral and vine scroll motifs throughout the abrashed field in a subtle palette of soft, neutral colors. Distressed, age wear.